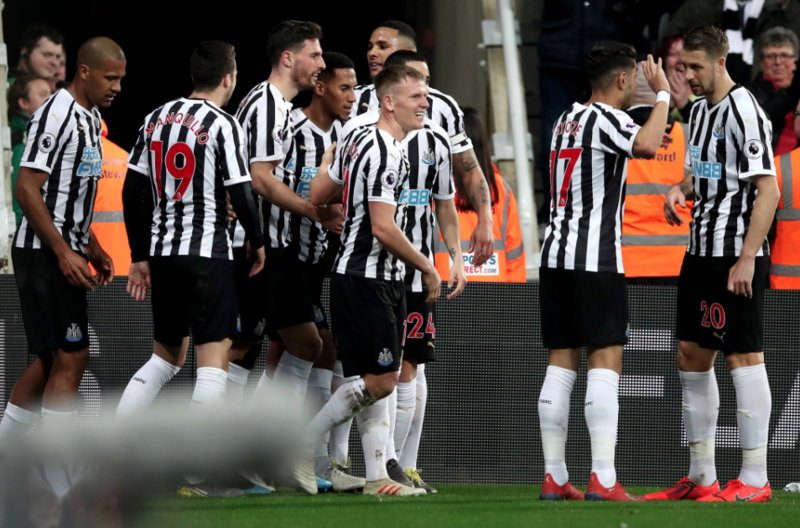 PLAYER RATINGS: Newcastle 2-0 Burnley – One stunning 9, several superb 8’s & a few 7’s – NUFC blog – Newcastle United blog – NUFC Fixtures, News and Forum. Yet another huge win at St James’ Park last night, with a 2-0 win over Burnley putting the seal on a perfect 4 days as far as our survival hopes are concerned. NUFC XI – (3-4-2-1): Dubravka (8) – Schar (9), Lascelles (8), Lejeune (8), Manquillo (7), Hayden (8) , Longstaff (8), Ritchie (7) –– Perez (7), Almiron (7) – Rondon (8). Dubravka – 8 – Once again, he was fearless in goal and looked anything but a player who’d made a few errors in two of his last three games. He claimed a few very awkward crosses brilliant and made a very good stop from close range to deny Burnley in the first half. His 10th clean sheet of the season and back-to-back shutouts and faultless displays at St James’ Park to immediately shut up any doubters. A class act whose name was chanted on more than one occasion at St James’ – and deservedly so. Schar – 9 – There were several strong performances here, but he was the pick of a good bunch. His goal was sensational and a 30-yard strike an in-form Paul Scholes would’ve been proud of, but he did much more than just that. His passing out from the back was so impressive, his ability to step out of defence with the ball was key against a Burnley side looking to frustrate us and he also stood up to the test well defensively against a team who threw a lot of long balls and crosses in his direction. He showed once again that he is not only a goal threat and an impressive creator from deep, but also a fierce competitor at the back. To think Rafa picked him up for £3m..
Lascelles – 8 – Stood strong against all comers, with him winning his battles against both Wood and Barnes and then standing up well to the awkward Peter Crouch late on. He may not be a ball player like Schar or Lejeune, but he’s the defensive man mountain between them at the back. Lejeune – 8 – Another intelligent and elegant display from the Frenchman. He showed his class on the ball with yet more inch perfect passes out of the back, but never looked phased by the physical threat Burnley possessed, often dealing with any danger expertly and holding his own against several of their big strikers in the air. The fact his return has coincided with our upturn in form is no coincidence..
Manquillo – 7 – He’s had his critics and rightly so at times, but he did a good job at right wing-back, making several well timed tackles, carrying the ball well and linking up with Perez nicely. His pace limits him, with there being a few occasions where we could’ve been away down the right if it was Yedlin and not him in the side here, but he was effective on the ball and stood up to the task well against a physical Burnley side. Hayden – 8 – He deserves a special mention today, playing the spoiler role brilliant with several key tackles and a number of important aerial wins against a side that only posed a threat when they knocked it long up to their two big strikers. He kept the ball moving nicely in possession and put in a huge shift off the ball, halting a number of Burnley attacks that could have caused problems had he not stepped in. Longstaff – 8 – A magic moment for the local lad in this one, with another classy display being capped off by his first Premier League goal. He was booked for a clumsy foul in the first half, so walked a bit of a tightrope from that point onwards in terms of how ‘stuck in’ he could get, but he made it look easy just about every time he got the ball. He seems to effortlessly create space for himself and never looks rushed, with him showing his ability to not only dirty work in midfield and pull the strings, but also pop up with a goal in the box. Another outstanding all round display. Ritchie – 7 – He faded in and out of games when used as a winger earlier in the season, but the same can not be said about him now he’s being used as a left wing-back, with him seeing a lot of the ball and thriving in this new role; especially now he has the movement and pace of Almiron just ahead of him. He had more touches than anyone else on the field and put in the dangerous cross that lead to Longstaff’s goal to make it 2-0. Perez – 7 – He was excellent in the first half, doing things quickly, looking sharp and linking up brilliantly as he popped up in that gap between midfield and attack. It must be said that he was sloppy in the second half, fading out of the game and misplacing a few simple passes, but it’s still been quite noticeable that his performance level has improved following A) the change in system, allowing him to have a bit more freedom as a winger come number 10 and B) the introduction of Almiron who’s helped create space and increase the fluidity and pace of our attacks. 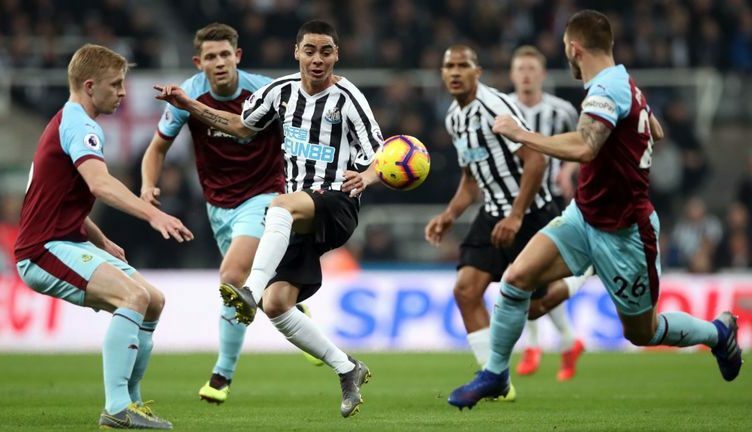 Almiron – 7 – After a stunning debut on Saturday, some people may have felt he was on the fringe of this game at times, but, even if he didn’t see a great deal of the ball or have much joy in the final third, his movement and energy off the ball was brilliant. He forced several Burnley errors from relentless closing down and the pure fact that his pace caused them to panic, with his runs both out wide and centrally helping open up a Burnley side that looked difficult to penetrate. His vision and perfectly weighted pass got Ritchie in behind prior to his cross that lead to Longstaff’s goal and his pace, energy and movement caused problems even when he was struggling to see a great deal of the ball himself. His debut may have been dazzling, but there were plenty positives to take from this one despite the fact Burnley did well to keep him quiet. Rondon – 8 – One moment that summed Rondon up in this one was where he sprinted across to our right hand side in the second half to cover for Perez who was caught out of position. A selfless act but one that showed how willing he is to run himself into the ground to protect our lead, also showing his impressive levels of stamina and experience. He made runs out wide, came deep to pick up the ball, was the link man between Perez and Almiron and was strong as an ox once again, battling for every ball and bulling quite a few Burnley players who tried to get between him and the ball late on. His presence in the box also played a big part in Longstaff’s goal, with Burnley failing to clear convincingly after he launched himself at Ritchie’s teasing cross in the build up. That sums him up really – if he’s not scoring himself, he’s playing a big part in helping the team; whether it be assisting directly or indirectly. He may not have been a major goal threat tonight and didn’t really look like scoring at any stage of the second half, but his all round play is invaluable. Dummett – 6 – His extra height helped late on as Burnley lumped it long in search of a route back into the game. Diame – N/A – Came on for the final 10 minutes. Put himself about, taking one nasty blow to the head in the process, with him making a few solid tackles to stop Burnley getting balls into the box. Joselu – N/A – Another player who appeared to be brought on late in the game simply to give us that bit of extra height against a big Burnley side whose only approach was to pump it long. WHAT A GREAT WIN CONGRATULATIONS LADS WELL DONE RAFA HWTL!!!!!!!!!!! !